Buses every 20 or 30 between Manhattan's major bus and train stations and JFK Airport. 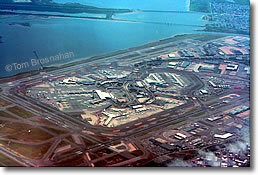 The faster, cheaper way to travel between John F Kennedy Airport and Manhattan is by AirTrain JFK and Long Island Rail Road to Penn Station, but if your destination in Manhattan is Grand Central Terminal or the Port Authority Bus Terminal, you may prefer the convenience of taking an express bus directlyfrom JFK Airport to those termini. These buses (Tel 718-875-8200) depart all terminals at JFK Airport every 20 to 30 minutes between 6:15 am and 11 pm, and travel to Manhattan, stopping at Grand Central Terminal, the Port Authority Bus Terminal and Penn Station. The 75-minute trip costs $15 one-way. Pennsylvania-based Trans-Bridge Lines (Tel 800-962-9135 or 610-868-6001) runs three buses daily between JFK Airport and the Port Authority Bus Terminal on their way to and from Bethlehem PA. The one-way fare is $12. The Trans-Bridge Lines bus stop is located in front of JFK's Terminal 4 on the arrivals roadway.